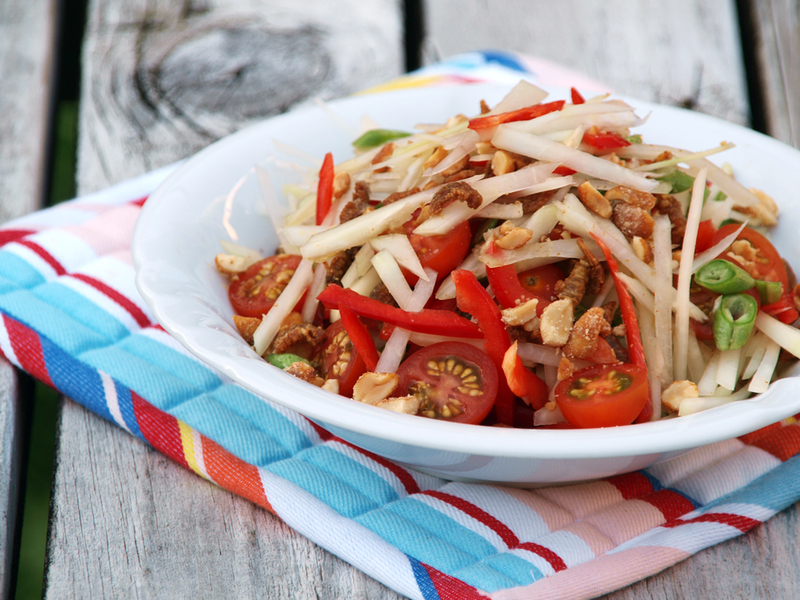 Som tam is a Thai dish made out of young papaya, long beans, tomatoes, roasted nuts and dried shrimps in a sweet sour and salty dressing made out of chillies lime and fish sauce. Ingredients apart from the papaya are then pounded using mortar hence the name which means “sour pounded” in English. Ordering this dish in Thailand it is customary for chefs to ask how you would want it, so you can customize the taste according to your preference. This is most probably the most popular Thai salad; it was also at number 46 on 2011 CNNGo’s World’s 50 most delicious foods. Som tam might be a weird dish to most of us due to the use of unripe papaya, but for Filipinos I guess they will say it will be something like atchara which is nearly the same apart from the souring agent use as the Filipino uses vinegar and no tomatoes or dried shrimps are added. This dish is usually accompanied with sticky rice, served over rice noodles, over raw vegetables or just a snack matched with crispy pork rinds (chicharon). How about you how would you enjoy this type of dish? Add 2 tbsp of oil in a small pan then fry dried shrimps until very fragrant. Separate shirmps with oil, set both aside. Mix together garlic, lime juice, fish sauce, brown sugar and oil from fried shrims in a bowl. Add papaya, tomatoes, chillies, dried shrimp, long beans and peanuts. Mix well then serve. Whenever I visit Thailand, the one food that I’ll always eat (on an almost everyday basis) is this dish. Now I can make it at home! 😉 Thanks for sharing! I don’t need to look at the picture but just hearing the words “som tam”, makes my mouth salivate because of the sour, spicy, sweet and salty flavours of this iconic Thai dish. I love to make this at home but we have seen such a great proliferation of Thai restaurants in Sydney in recent years, each one trying to outdo the other with their own take of this dish, to the benefit of Thai food lovers. Oh I love the Thai salad so much! I just love Som Tam, and would eat in any way it was presented ! I love Thai food and this is a dish that I have not tried yet. Looks delicious! Very cool. New to me, which makes it doubly interesting. I’ve never had this, nor (to my knowledge) unripe papaya. I doubt if I’ll ever get around to cooking this one, but that doesn’t mean I don’t enjoy – greatly enjoy – reading about it. Thanks! I love green papaya but I’ve found it’s hard to find in regular shops.. did you get it from an Asian grocer? I had this salad in the Philippines actually at Fely J’s Kitchen in Greenbelt Manila – with tomatoes. It was divine. I’ve never even heard of this dish before and it sounds like I’ve really been missing out. The colors are gorgeous and I bet all the flavors were great together. oh yummyy!! This sounds like something that I’d love to try!! It has a long of ingredients that totally appeal to me! Especially the dried shrimps! haha.. The only thing I’d probably change is the number of chillies! som tam is one of my favorite thai salads and a must order every time I visit a thai restaurant. Your recipe looks amazing! When I make this at home I use a slice peeler to shred the papaya. I am just too lazy to cut it by hand. Thanks for the great recipe! I love your version of this salad. So lovely and delicious. Green papayas even are difficult to find in HK. Any ideas for substitute? grated Swede is a great substitute! the only papaya salad I’ve had looks different than this- this one looks so flavorful! I love Thai food but I am not sure if I tried this salad before, and from the look of it, I don’t think I’ve tried! Looks refreshing and delicious! I always love the fish sauce, lime, and sugar taste. Hmmm delicious!! I have this papaya salad before as well as the Vietnamese and Indonesian versions. Three of them are delicious! Perfect for summer and I like enjoying them with a glass of iced calamansi to wash down the spiciness. Very lovely salad – can I make it vegetarian? Yes you can use vegetarian fish sauce and omit the dried shrimps and use deep fried tofu skin cut into small pieces. If you cant find Green papaya, grated Swede is almost identical and it is sometimes used in Thailand as a substitute.